(Chef Jeff Mayo/Sour Cream). As I live and promote a processed oil-free lifestyle, I wanted to create a recipe that came as close as possible that was void of oils, low on sodium and smooth in texture. Also I wanted it to be gluten, soy and nut free. So many food dishes are complemented by these two condiments. I have always loved mayo and sour cream. However, the largest ratio of ingredients is oils. Even when I ate dairy I knew it was unhealthy. Here is the result. Enjoy. These recipes are nearly exact. The difference is mayo is less sour and thinner in consistency and sour cream is thicker and sourer. Each is adjusted accordingly. For those that prefer to use dried beans, just rinse them and soak refrigerated overnight in a 1:3 ratio of 1 part dried beans to 3 parts water. I add ¼ tsp of Himalayan salt. I do this as I am irrationally paranoid of bad bacteria, but honestly, this step is not necessary. Then cook the beans for 60-90 minutes in clean water. As a side note, Dr. Greger states organic, no-salt-added canned beans are perfectly fine regarding the health benefits. Aquafaba is specifically the liquid from canned beans. It is a highly nutritious and versatile liquid that can be used as an egg replacer and even whipped into an awesome dessert cream. This recipe requires it. One 15 oz can of Northern white beans or chickpeas, for example, will typically yield ½ cup of aquafaba. Never throw this liquid out. It freezes very well. Save it for future recipes. For the mayo, If you are using canned northern beans you will be including the liquid from the can. If you soak your own dried beans you will need to add ¼ cup more aquafaba, totaling ½ cup which it the exact amount yielded from one 15 oz can. In a blender or food processor combine all the ingredients and blend until smooth. This will last in the refrigerator for about a week as the acids act a preservative. Up to two weeks if you add ¼ tsp salt preferably Himalayan. This always tastes best fresh. Do not double this recipe unless you intend on consuming within 5 days. It’s not that it will go bad, the flavor and consistency will start degrading over time. 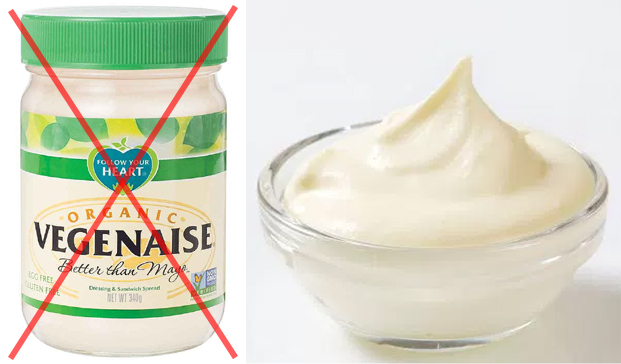 This is nearly the same as the mayo recipe with a slight adjustment to the acidic component ratios and the amount of liquid used to allow for a thicker consistency. Follow the instructions above but alter the following ratios. As we want this to remain thicker and if you are using canned northern beans, drain them first. Any recipe that requires mayo or sour cream these will substitute perfectly.